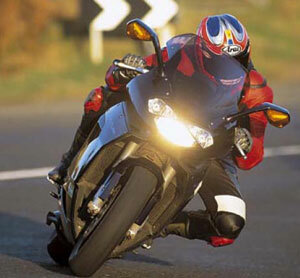 How fast is an Aprilia Futura? The old question: How fast does it go, mister? This page covers what a standard Futura will do, and what you can do to make it accelerate faster, build torque or both. Well, one road test is pretty much like another, so here are the vital statistics from Bike magazine’s (UK) test of a standard Futura does 155mph. One on a 15 tooth sprocket does an indicated 145mph at the redline. Peak power was 101 bhp at 9,500rpm and peak torque 62.6 lb-ft at 7,450rpm. But remember, bike mags only test new or nearly new bikes, and anecdotal evidence suggests that the bike isn’t fully run in until at least 10,000 miles, and gets faster as it loosens up. For more detailed figures, see the road test archive. Changing the exhaust – in particular by junking the pre-silencer and/or end can. Changing the air filter and other air mods. There is an ongoing debate on whether airbox de-restriction makes any difference at all. If you’ve altered the exhaust in any way, you may find a flat spot in the rev range. Clean it up with a TuneEdit or a Power Commander III or Tuneboy but don’t forget to budget for dyno time to set it up properly. If you want to accelerate faster at the expense of about 4 mph of top end speed, then fit a 15 tooth front sprocket. You won’t find any extra power by lightening the flywheel, but the bike will rev quicker and those who have done the flywheel mod reported a sportier feel from the motor. Another point worth mentioning is that whatever you do to a Futura it won’t go any faster than the top speeds listed above unless you alter the gearing. It will get there a hell of a lot quicker, though! The following thread on the Apriliaforum is most illuminating: Apriliaforum: Top Speed?